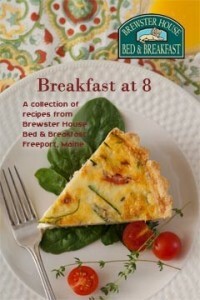 Our Cookbook “Breakfast at 8” is at the Printers! Over the years guests have regularly urged Ruth to release a cookbook. Sometimes it is because they love the sweet or savory breakfast main courses we serve at Brewster House, sometimes it is the fruit starters, sometimes the cookies, scones, or whatever. But the consistent request is that Ruth put together a cookbook. We can now tell you, the time has arrived. We went back and forth on the idea for a couple of years, then decided to prepare the cookbook last year, but ran out of time. This year, however, we made it a priority, and pulled together all the recipes. Ruth started with over 40 pages of them, then chose her favorites, made some changes, additions, and all the tweaks that go with the editing process, and Breakfast at 8 was born! It went off to the printers for assembly and proofing, some additional changes were made, and we are now awaiting delivery of the first run of books. We expect to have the books available for sale by some time in April, and hope to have online ordering available, too. We are taking pre-release orders now by phone or email, at $17 (tax and shipping included).